Today is Independence Day in the US. To celebrate this unique holiday (or to some extends, to celebrate those who aren’t partying today), we have a special offer for you. The offer is all three licenses (Hobbyist, for 1 site; Professional, for 5 sites; Developer, for unlimited sites) will get a 20% price drop. That means Hobbyist license will only cost $15.99, Professional license will only cost $47.99, and Developer license will only cost $159.99. 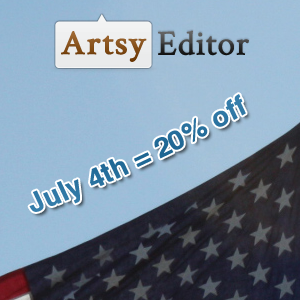 The discount code is JULY4TH. 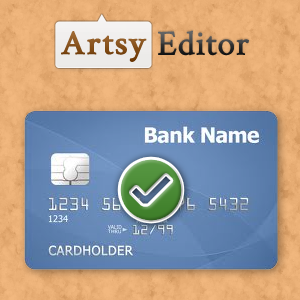 You are not going to see promotions & public discount codes often for Artsy Editor. So don’t let this once in a lifetime opportunity slip past you! This offer will end this evening, 11:59 PM PST. To get started, simply head to our pricing page to choose your desired license, then enter the coupon code JULY4TH at checkout. Just want to write a quick note to inform everyone that you can now pay with your credit card even you don’t a PayPal account. 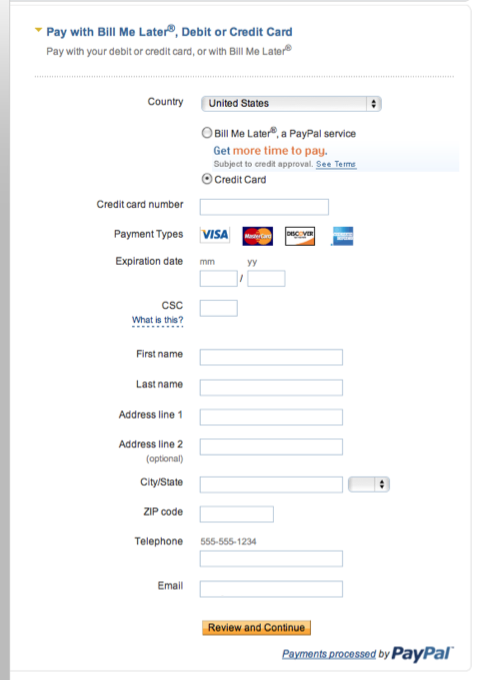 The payment processing system we originally used was PayPal Express Checkout. Although it took less time to implement, it didn’t allow any payment from people without a PayPal account. We’ve lost few sales just because of it. I spent couple hours yesterday working on a new integration with PayPal Website Payment Standard, which lets you pay with your credit card even if you don’t own an existing PayPal account. Then you just enter your credit card information. A thank-you goes to everyone that expressed their needs about this via email on the last couple days. I truly appreciate it. Without you, I wouldn’t even know that I lost sales because of the payment limitation. 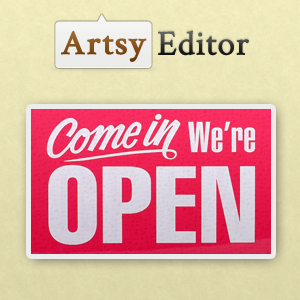 I built artsyeditor.com using Simplicity, a beautiful theme crafted by the folks over at WooThemes. The customization process had been quite an experience, and I decided to share some of the tips and tricks I learned along the way so other Woo community members out there can take advantage and learn from those. So I contacted Adii, co-founder of WooThemes, and he happily gave me the opportunity to write on WooThemes’ popular blog. If you just want to try us out, here you go! Back in March, I wanted to build a better WordPress editor. I interviewed 100+ people, and had 38 willing-to-pay customers before writing a line of code. The feedback has been astounding. So I decided to built it! After 2 months of solid design and programming work, we are ready for you! In version 1.0, we focused on the four main problems that our customers asked us to solve. 1. A clutter-free environment to write. I used the show-up-where-you-need-it-when-you-need-it technique. The editor shows up right below your mouse cursor. 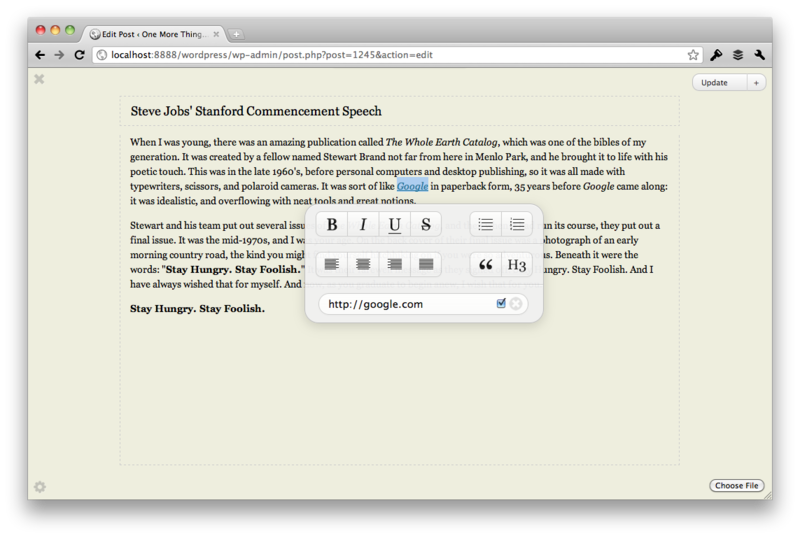 So when you format a blog post, you can save the time on moving from selected word to the top of editor. Also, when nothing is selected, the editor fades away. It gives you more space to write and less distractions to worry about. 2. 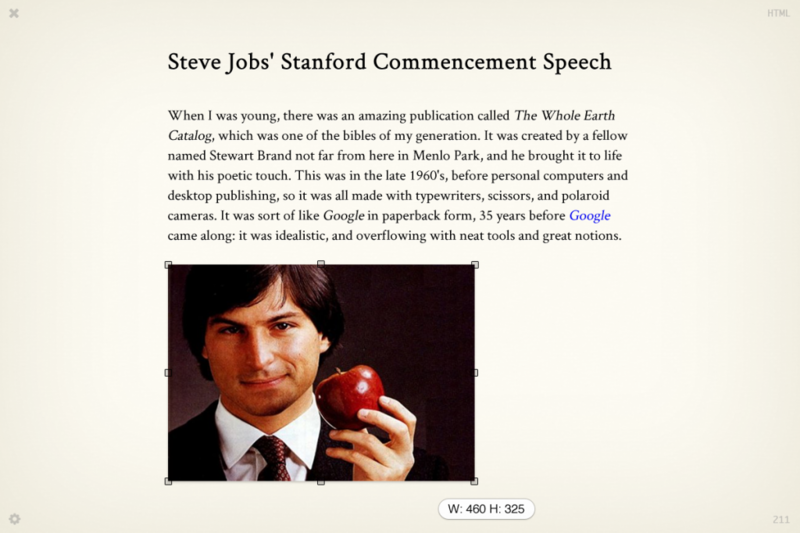 Ability to drag-and-drop image. Gmail had added drag and drop attachments feature for a year, and people had been asking me if it is possible in Artsy Editor. The answer is yes. You can drag in any images from anywhere in your computer, Artsy Editor will handle the rest (uploading and inserting). So you don’t have to waste the time navigating through the file system. 3. Simplify image resizing process. I personally think this is a feature many people will fall in love to. 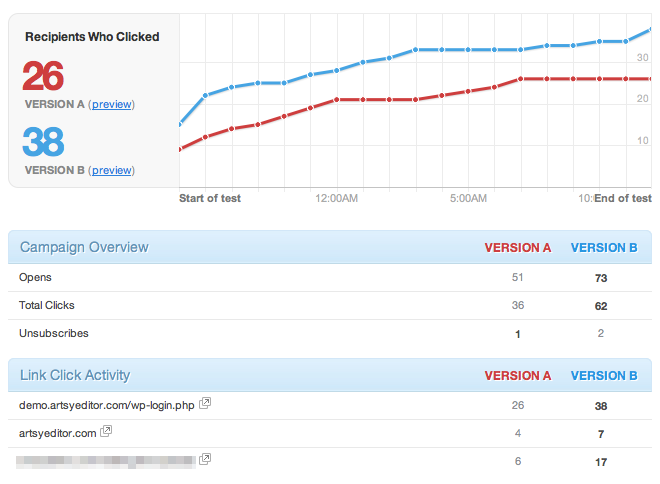 The screenshot on the left is how WordPress handles image resizing, the right is how we do it. There is no overlay to open, no number to enter and no percentage to choose. Just drag the little handle to the size you want. Do you remember yourself waiting for the link overlay to load and wish it comes on faster? In Artsy Editor, that problem is solved intelligently. Instead of an overlay (which is what standard WYSIWYG uses), we have a link field inside of the formatting box. So just highlight the text and add your link. Tick the checkbox if you want to open in new window. Check out what our beta testers have to say and the results of our pre-launched sales to mailing list subscribers. Hobbyist. You can use the Hobbyist license in 1 blog. This is great if you are a hobbyist blogger who spend nights and weekends writing about what you love. It will cost $19.99. Professional. You can use the Professional license in up to 5 blogs. This is great if you are a professional blogger who write/manage more than 1 blog. It will cost $59.99. Developer. You can use the Developer license in unlimited blogs. 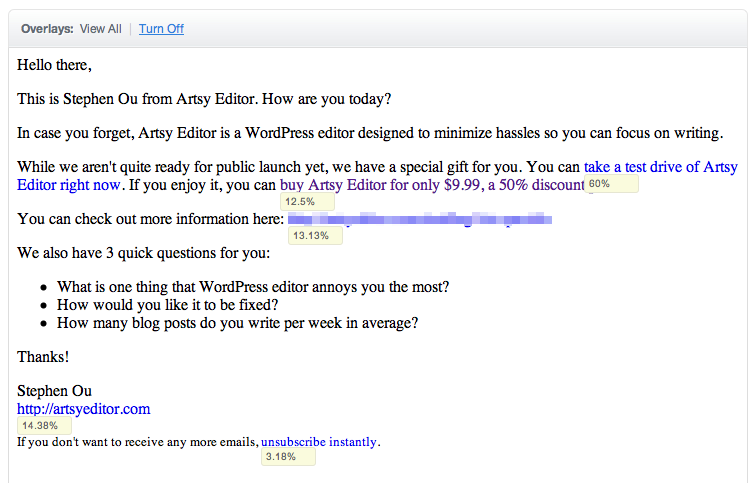 This is great if you are a developer that build WordPress websites for clients. It will cost $199.99. Can’t wait to try it out?! We’ve set up a full-fledge demo for you to try out (no limitation, no signup required). Otherwise, you can take a look at our homepage with more feature information. Oh, don’t forget to email or tweet to your friends if you think they deserve to know! Last month, I read a post by Joel Gascoigne questioning the necessity of a coming soon page that only collects email addresses. 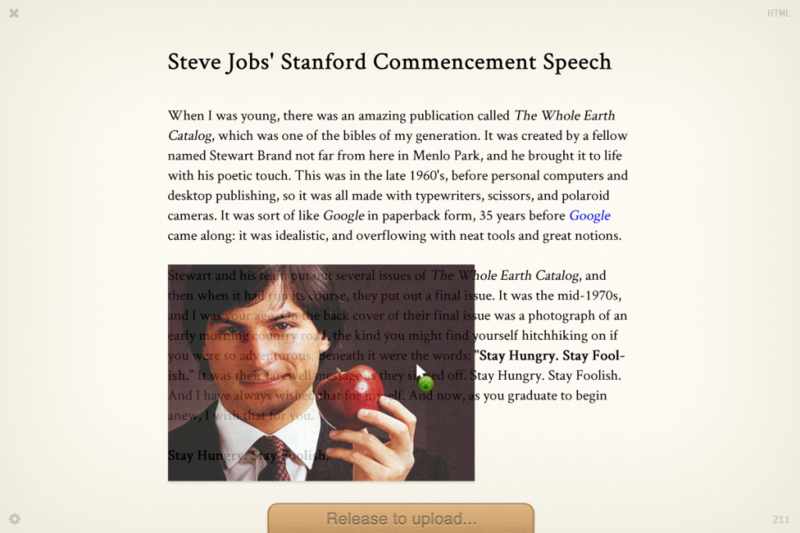 Instead, he proposed skipping it completely and putting up a landing page for the product. Pretend that the product exists, then validate product potential from people’s reactions. While I did go through a well-rounded process validating my idea (getting 38 willing-to-pay customers before writing a single piece of code), my coming soon page was only to collect emails – alongside showing a screenshot and a description. There aren’t much information on how it will work. 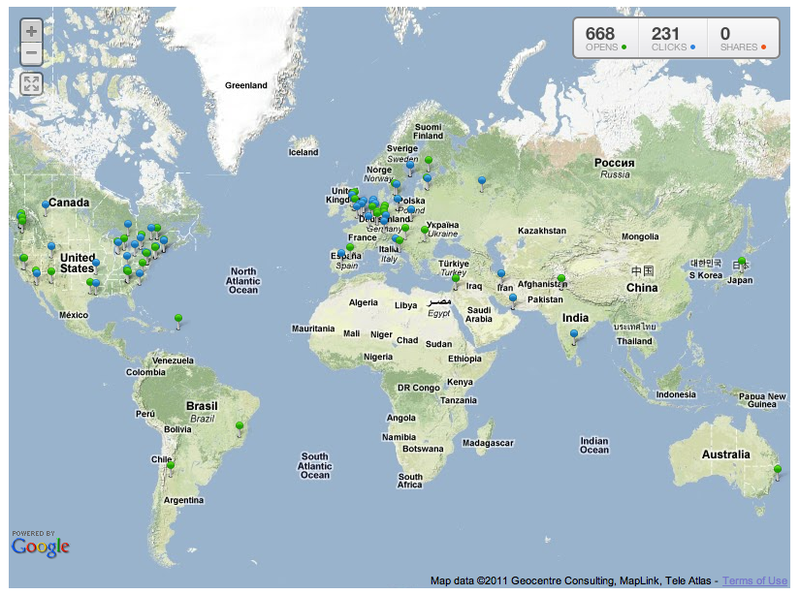 Through a series of promotions I started, I was be able to get 646 people’s interests in 2.5 months. 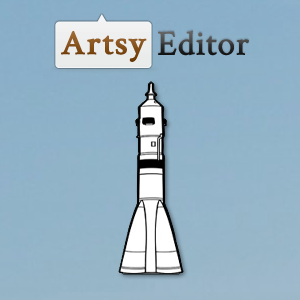 Instead of letting those leads sitting around until launch, I decided to utilize it beforehand to further validate the potential of Artsy Editor. 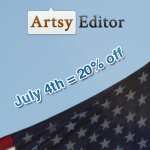 I put up a secret sales page where people can buy Artsy Editor at a heavily discounted price. What is one thing that WordPress editor annoys you the most? How would you like it to be fixed? 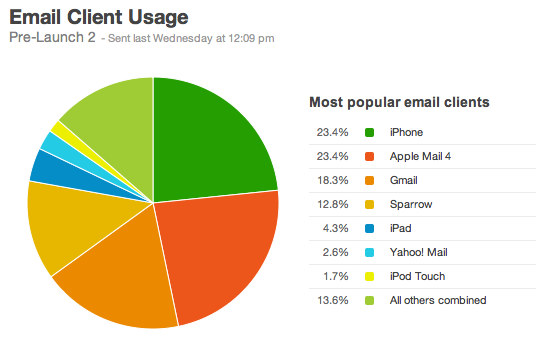 How many blog posts do you write per week in average? I am very into analytics and numbers, so I set up a A/B test in Campaign Monitor to measure open rates, clicks, and conversion rates. I didn’t send to 646 people together. I separated them into 3 days. Reason being 1) in case there are anything wrong in the server or in the plugin, I have time to fix it before getting into everyone’s hands, 2) I don’t want to get overwhelmed with feedback & suggestions. I made the right decision. 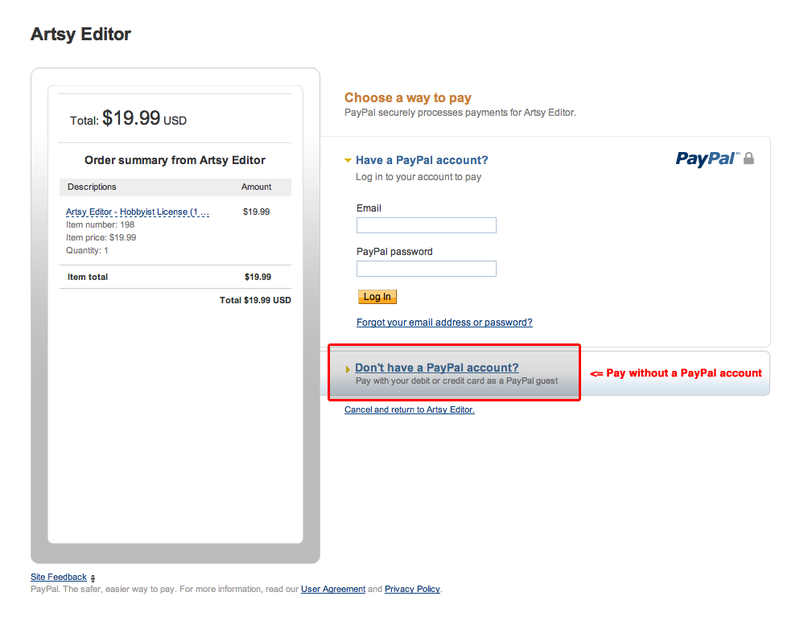 Because the payment processor threw out an error when customers returned from PayPal after payment. But I was be able to fix it quickly and only 1 person was affected. This is the winner A/B test version as well. You probably ran into this situation before: when you felt something wasn’t polished, you fixed it. Then during the subsequent testing, you found something else weird, you wanted to change it as well. At the end, your release was either behind schedule, or worse, never launched. I suggested you to do the opposite. Try to get it out the door quickly, even if it contains minor flaw here and there (not critical bugs, though, I will explain why in #4). I know this is hard for you to let your customers see a weak point in something that you are proud of. But think about it this way: you will never know what your customers prefer until you show it to them and ask them. As I mentioned above, I utilized every opportunity I have to talk to my potential customers. 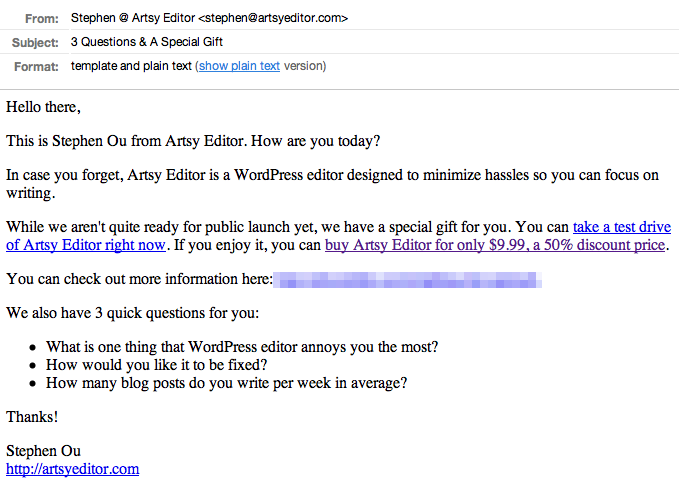 This time, I discovered that WordPress developer is a big market that Artsy Editor can sell to. 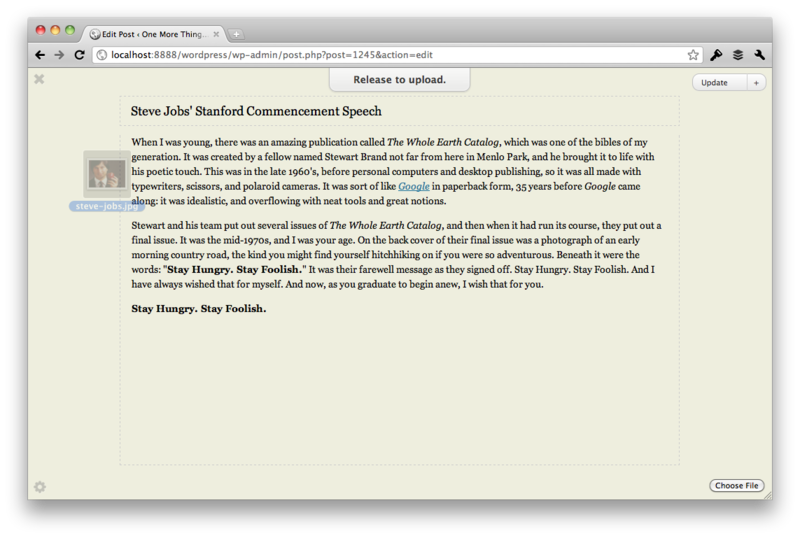 Because I learned from 3 freelancers that their clients had asked for a cleaner way to write content on WordPress. 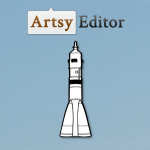 Artsy Editor looks like the right fit for them. If I never talked to them, I will never know there is such a huge need for it. I will never dig this piece of gold. Talk to your anyone, you will discover something you never know before that will probably help boost your business. Measuring metrics now means you can save time or make more money in the future. It is a very simple theory. If you figure out the things that work out better, you can simply do that the next time and not waste any time/money on the other. That’s why I keep an eye of any numbers I can get a hold of, whether it is conversion rates or click-through rates. Just keep testing and measuring, so you know the right way to do things. Honestly, not everything was going that well. One beta tester (actually he has been my mentor since the first week of Artsy Editor) had experienced a bug where the editor crashed and the content iwa not auto-saved. This is a big deal, because he couldn’t get the content back. This is the thing that I want to prevent: a critical flaw, something that loses user’s data or breaks the fundamental functionality (a.k.a. if this doesn’t work, it’s gameover). Auto-saving fits into this category. When I received this bug report, it was 3AM PST. So when I woke up, I had to rush to my computer, fix the issue immediately and release an update. Then I sent an apology email, explain the bug, and promise that this will never happen again. Yes, we are launching tomorrow morning so keep an eye on our homepage for more information! You give them your email because it looks interested. You wait… kind of lose interests gradually. They send you a promotional email at the launch day, but you feel like you aren’t interested any more. My philosophy is to be as transparent as possible. 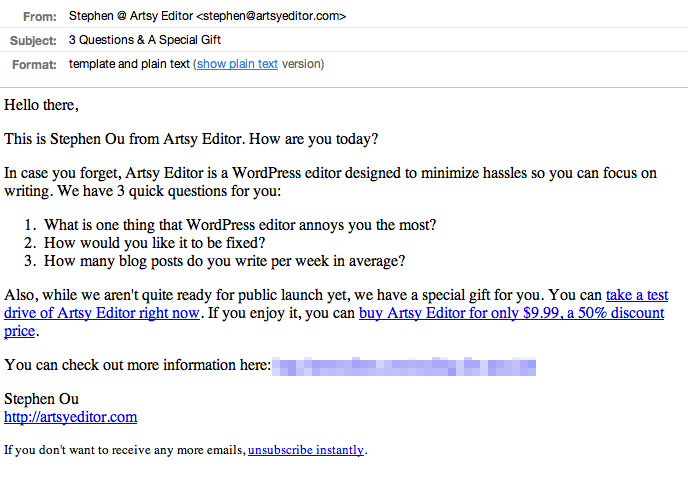 I don’t want people to just give me their emails and expect them to pay me money for a WordPress plugin. I don’t think that’s how it should work. I want to keep every interested prospects up-to-date with my progress. So they know what’s going on and what to expect. The progress had been fantastic. We’ve got the basic WYSIWYG working, including formatting, adding links, as well as the code that integrates it as a WordPress plugin. There are still a lot more to be done – things like image uploading, image resizing, different settings, and small bits and pieces here and there. But you can definitely expect what you receive from me will be top-notch. After the successful first round of idea validation, I’ve put less time into talking to people about Artsy Editor and more time into design & development. This week, I am back to focus on marketing. I am going to slowly and gradually get in touch with power bloggers so I can see what problems they are having with WP’s editor. They are going to be a huge percentage of my target customers. 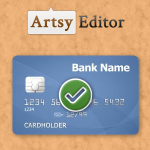 So I want to make sure Artsy Editor is going to fit their needs and worth what they are paying for. How is it going to be out? I don’t do ETA, anything unpredictable can happen anytime. I keep telling myself June. But It can be earlier or later than that, depends on how things go. But the thing I can promise is I will not rush and deliver the best editor I can. 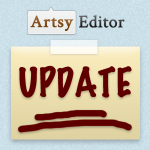 Will it be a generic version of Artsy Editor (not WordPress only)? 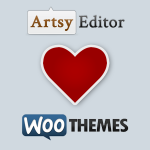 My current focus is WordPress. It’s a strong & huge community to be in. And it will be easier for normal, non-technical folks to use it (just purchase, upload, and activate it). But if enough people have that request, I will consider it in the (not-nearish) future. 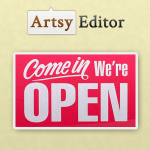 Lastly, I want to let you know I am open for any suggestions or questions – just email me at stephen@artsyeditor.com. I will get back to everyone of you. Also, I will continue to keep you guys updated as I move on!